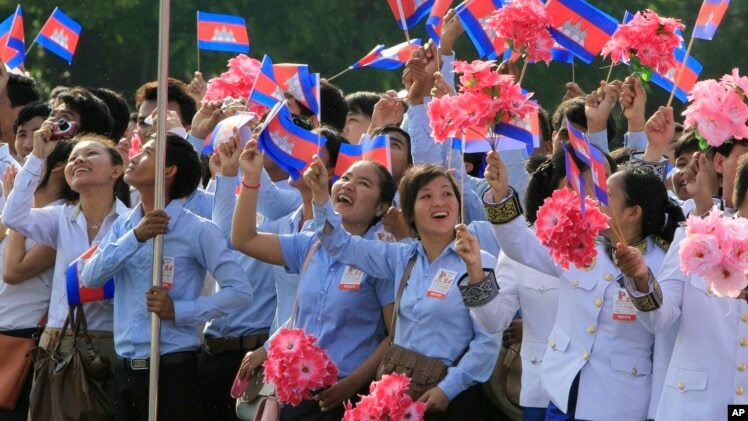 FILE – Cambodian students are seen waving national flags during Independence Day celebrations in Phnom Penh. Currently women political leaders are not creating a substantial impact in Cambodia. But a new reportfrom the U.S. Agency for International Development says the symbolic representation of women leaders is shifting the attitude of young Cambodians, who are the driving force for greater equality. The report finds one of the greatest factors restraining women’s empowerment is a lack of self-confidence and support from their family and community. Although support from men and the Cambodian government is increasing, “cultural norms” are inherently preventing women from pursuing political leadership roles and participating in public engagement. The program evaluator for the USAID report, Darcy Ashman, explains traditional codes of conduct for Cambodian women continue to function as a barrier to empowerment. “Because the culture says to women, ‘You belong at home. It is men who are in the public eye.’ As a rule, they tend to not have the confidence to take on those roles,” Ashman said. Politicians, such as female member of parliament Mu Sochua, agree a lack of self-confidence is the main challenge. “Very often women decide not to stand for office because they are not sure of their ability. In this case, this has nothing to do with the political party,” she said. Additionally, opportunities for women to pursue public roles are limited because of their traditional responsibility to care for the household and support the family income. Sopheap Chak, Cambodia Center for Human Rights director, agrees with the USAID report that Cambodian social structures have placed women at a disadvantage. But she says support from her family was a big motivation for her to become a leader. “As a Khmer woman, I feel that although the society outside of the home tends to discriminate against women, I am lucky to have a supporting family that encourages me to go to school and that treats their sons and daughter equally,” Sopheap Chak says. Dr. Chhiv Kek Pung, a prominent human rights activist and director of Licadho, shares her journey of becoming leader, saying support from her husband makes it easier for her to be a wife and a human rights activist. “I am also lucky that my husband understands and supports me and my participation in society,” says Chhiv Kek Pung. Experts in women’s empowerment and political leadership often cite a lack of opportunity for women to access high quality education. This limits women from being socially and politically active, especially in rural communities. As an urban resident, Kounila Keo, a Master Student in Public Policy at Lee Kuan Yew School, says women have an equal opportunity to receive an education in Cambodia. “As a Khmer woman, I have a personal, familial, and societal responsibility. I think that as women, we have to strongly believe in ourselves that we can pursue higher education and do important work in society, and be independent,” she said. Twenty-five year old Kimlay Leav, the President of U.S. Ambassador’s Youth Council, says he strongly supports women leaders. “When it comes to women’s political leadership, I believe that they can help better design policies at the local and national level to deal with issues such as economic prosperity and political atmosphere, particularly issues affecting women and children,” says Kimlay Leav. Another member of the U.S. Ambassador’s Youth Council, Chansatya Meas, said the situation in Cambodia motivates her to become a leader. “Having many women leaders in the society motivates me to become one, but that is not always the case. I personally want to become a leader. And I think because of a lack of women leaders, I am strongly motivated to become a leader,” she said. As part of its Millennium Development Goals, the Cambodian government aimed at having 30 percent of the Parliament and Senate represented by women, but this goal has not been achieved. But according to the USAID report, although the current situation for women leaders in Cambodia is primarily symbolic, their presence is contributing to a shift that supports women leaders who can actually effect change. This report was produced in collaboration with VOA’s Khmer Service.